As you most likely already know, I have been blessed and honored this year to be allowed the priviledge of hosting a few give-aways, with Spartan race being one of my largest contributors! I have recently been asking my winners to write a short bio to introduce themselves to the world, and know its time to meet Katie, the lucky (?) winner of the December 24th Spartan Race Entry Drawing! I am working on the review for my recent Spartan Beast…I did it barefoot! Stay Tuned, and Stay Muddy My Friends! My name is Katie and I am a 30 year old stay at home Mom to two wild and beautiful little girls. If you had asked me two years ago if I would ever consider signing up for a Spartan Race, I would have thought you lost your mind. Since then, I have lost around 80lbs and I have found a passion for running and OCR’s. I ran my first 5k in March 2012 and then my second for Thanksgiving the same year. My husband then signed me up for my first OCR (Hog Wild Mud Run) in February 2013 and I was quickly hooked. I ran 13 races in 2013 with 5 of them being mud based. I am really looking forward to the Spartan Sprint Special Ops here in Tampa! I’ll most likely end up signing up for the Super in Miami, too. I have definitely been working on my upper body as well as burpees to get ready. My biggest goal is to make it up the rope. That has always been a struggle for me. 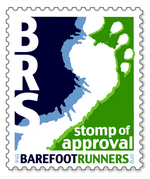 I originally found your blog when I first started researching barefoot running. I haven’t had the guts to go full barefoot yet but I do plan on doing at least one mud run this year fully barefoot. For now, I wear my Vibram Fivefingers for any OCR, my Altra Lonepeaks for road or trail running, and everywhere else I wear my Xero shoes. I fully believe in comfort and keeping my feet happy! Since I’ve gotten more into races, I’ve also started following a lot of blogs. My #1 of course being the amazingly-handsome and super-talented MuddyJ ;), I also love following Lisa from Yo Mama Runs (an amazing lady-mom of twins and an ultra marathoner), Dani from Weight Off My Shoulders (amazing weight loss transformation and about to run the Dopey Challenge at Disney), and definitely Jeff Galloway is one of my favorite runners. I wouldn’t be where I am today without using his techniques. Thank you so much for hosting this giveaway! As much as I love racing, it’s just not always in the budget. I can’t wait to be a Spartan and I will definitely let you know how it goes. AROO!